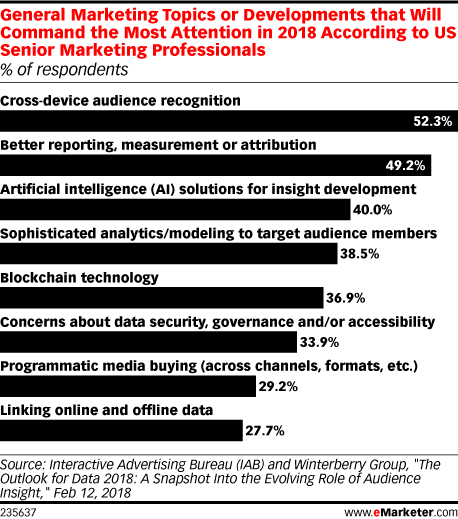 Data is from the February 2018 Interactive Advertising Bureau (IAB) and Winterberry Group report titled "The Outlook for Data 2018: A Snapshot Into the Evolving Role of Audience Insight." 99 digital media professionals were surveyed online between December 2017-January 2018. Respondents were members of IAB special-interest data and programmtic councils. Respondents were not required to answer every question. Respondents identified their profession as marketers (5.1%), marketing service providers (17.2%), publishers or media providers (30.3%), technology developers (41.4%) and other (6.1%) with less than 1 year experience (0%), between 1-5 years (13.1%), between 6-10 years (26.3%), between 11-15 years (24.2%) and more than 16 years (35.4%). Winterberry Group is a consulting firm for advertising, marketing and media organizations.